Whether it is daily life thing or any day at work, we are always comparing to see whats good and what is not so good. This differential analysis has a much popular name as variance analysis. Whenever, whatever and whoever is deciding, you got to have the variance report to better understand the situation and what control actions are needed. Read this if you are interested in details about What is Variance analysis? Not much a of a fan like this… right? Lets face it! when you are in the seat deciding things you would like to have the data in such shape that you can process with most of your organs and senses and not just brain. That is why colors, charts and mix of other things are used. Following are 10 techniques to take variance analysis beyond simple numbers and percentages. Click OK and now you have negative numbers in brackets. With negative numbers enclosed in brackets, the digit’s position is shifted a little and can cause confusion. Adding “_)” element helps get it sorted. See we are adding it only to positive number and zero portion of the code. We can even use colors to differentiate the negative numbers/percentages from positive ones in addition to brackets or on simple numbers. This will give positive numbers in blue color, negative numbers in red and 0 will remain default color. This code will show positive numbers in blue and negative numbers in brackets with red color while keeping the column aligned nicely. So what we did is basically add color codes in square brackets for each of the positive and negative number portion of the code. You can use other specific color codes as well or apply a color only to negative or positive number. We can use up and down arrows to show the positive and negative numbers or favourable and unfavourable variance. The basic trick is to input character code using number pad while holding down the ALT key on the keyboard. Yes! you need number pad for this. Number keys above alphabet keys won’t work. Select the data and go to custom number format dialogue box by hitting Ctrl+1 combo. Go to custom and remove anything from type input bar. Press “0” key followed by a tap of spacebar and then press + hold down ALT key and from number pad press 3 followed by 0. Let go of ALT key and an arrow up will be inserted! Or simply ALT + 3 + 0. As you can see we are including only esterisk symbol before the space character to the same code discussed earlier. If you are not fond of colored text then you can use cell color to change for negative and/or positive numbers. Click format button and select the color of cell you desire and make other formatting related changes if you want. Once done click OK to apply the conditional formatting. 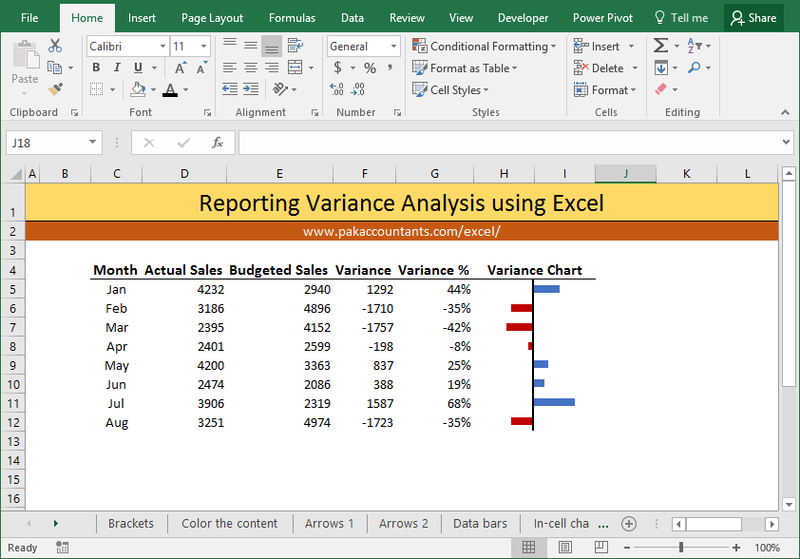 We saw how to use arrows to differential positive and negative figures using custom number formatting in method 3 above, but you can do very similar thing using conditional formatting as well. Go to home tab > styles group > click conditional formatting drop down button > click new rule. Having the first rule type selected, change format style to icon sets. Change to icon style of your choice which in our case is arrows. From the type drop down change the value to “Numbers” for both. Have the first condition as “>” 0 and second condition has “>=” 0 and click OK.
One my favourite way to present variances with great visual impact that adds a lot to understanding and the best part is its super quick to implement. Select the data > go to home tab > styles group > click conditional formatting drop down button > data bars > select the style you like. Done! So far we have been utilizing builtin features of Excel. Like databars that do really good job, but there is limited control. Another alternative is to make in cell charts using REPT function with symbols. This technique requires two columns as we will be “plotting” negative and positive numbers separately. I will be using “|” called pipe or vertical bar. You can use any other symbol you like but this is the most easily accessible right from your keyboard. So we will we use two columns, left one for negative figures and right for positive figures. Select the cells and double click the fill handle to populate through whole range. Now we need to do a little formatting. 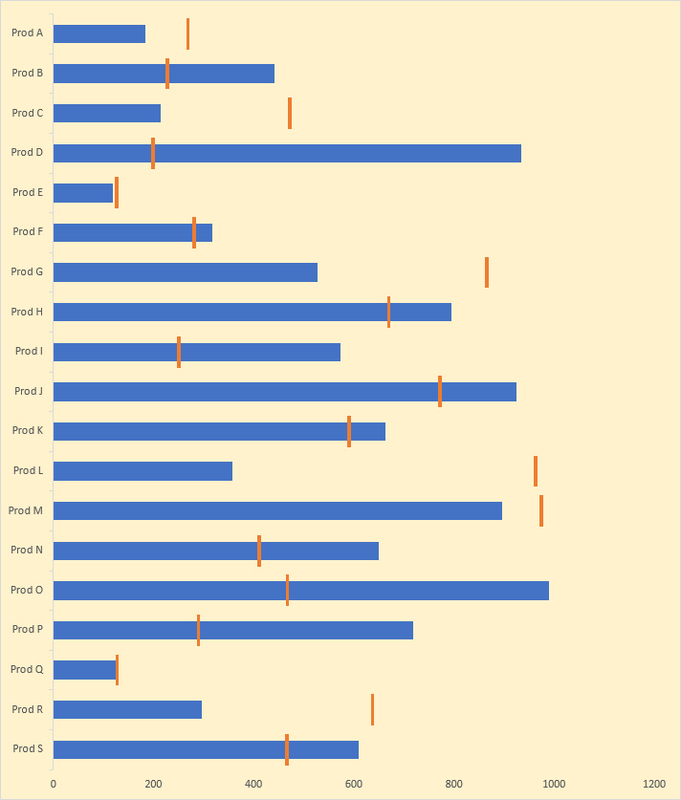 Select the negative graph column and make it right-aligned. Select both columns and change the font to “Stencil”. Give negative column red color and positive blue or any that you like. If you you don’t hav “Stencil” installed then you can use “Britanica Bold” or “Playbill” just to do the same. If you think chart is taking too much space then you can adjust the size of font or change the multiplicative factor of “100” in formula to 50 or any lower number. For best understanding have the width of both columns equal. Well this is definitely an option no denying in that. But best part is that you can scale them down to fit just like in-cell charts. 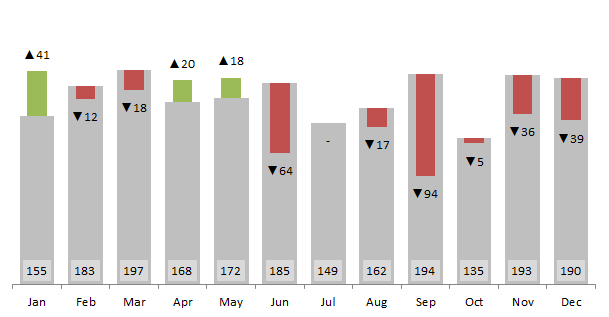 I really like scaled down charts as they do really good in excel dashboards. Select the data meaning only numbers or percentage whatever you want to use as base data for chart. 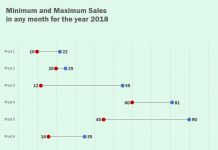 Go to Insert tab > charts group > click column or bar chart drop down button > click stacked bar chart. Chart will be inserted. We need to make few formatting changes like getting rid of legends, title, bottom axis scale adjustment and later deleting it, and hiding the series labels using custom number format option to be left with bare bars! In my case the values are plotted as last value first. To correct this we can choose the “reverse order” option. Now the values are plotted in the right order and also on the correct side of the chart i.e. positive values on the right side and negative on the left. Probably the most interesting of all of the above. This is basically a chart but designed in a way that positive values are plotted with different color and negative values are plotted with another. In addition to this, I have added On/Off switch so that if someone wants to highlight only negative or positive figures then it can be done easily. 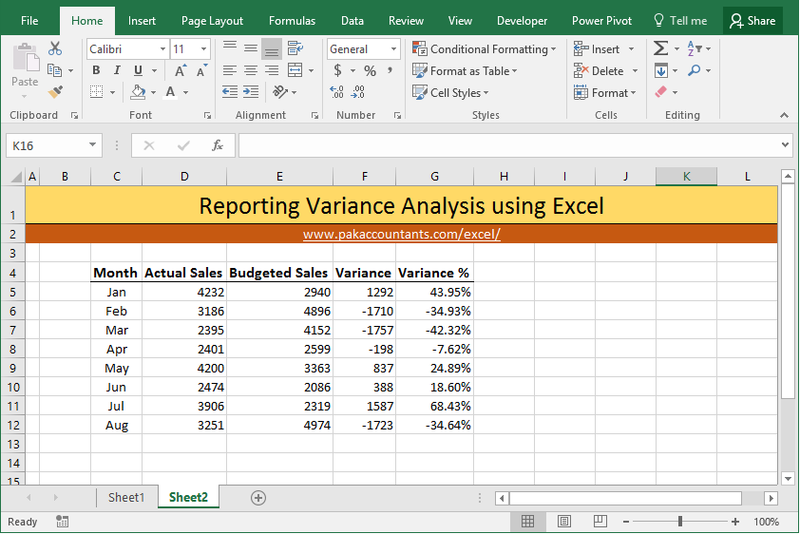 This advanced variance analysis chart does more in less space with amazing clarity to present actual and budgeted or targeted results in one Excel chart. 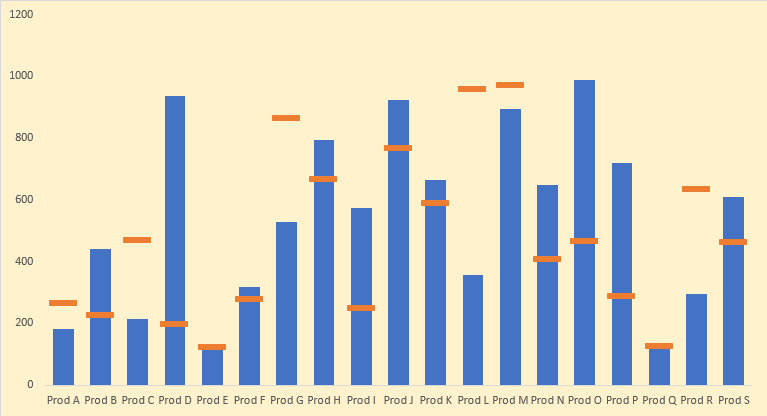 To learn how to make this chart head over to this detailed tutorial. 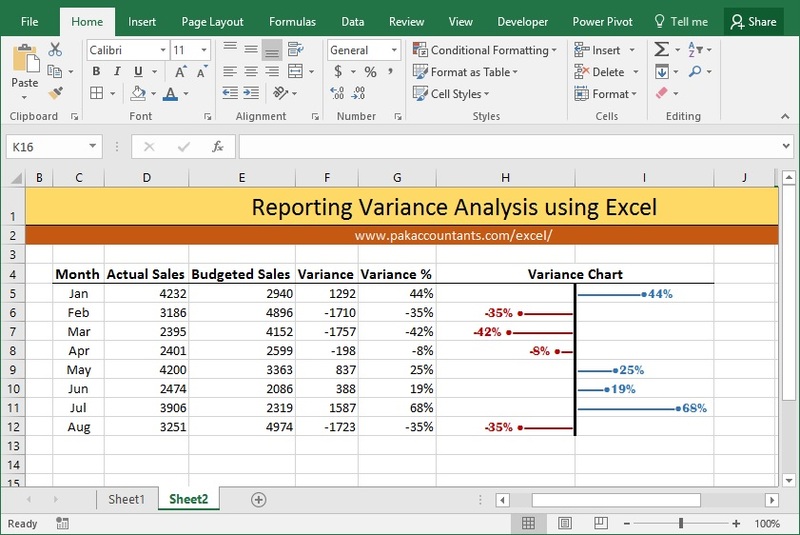 In this quick and easy tutorial you will learn how to make a variance analysis chart in less than 60 seconds that is not just functional but beautiful to look at as well. To learn this specific chart head over to this page to read the tutorial. With advancement in tools we use to manage and communicate, our screen orientation has taken complete 90 degree change and this is where this charting technique comes handy. Instead of having your cell phone in landscape orientation and still missing the bits, you can keep the cell phone in natural portrait orientation and easily scroll up or down for even longer charts. 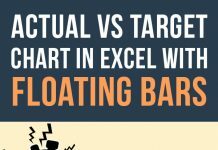 Also you will learn a fine technique to have floating bars using ONLY bar charts. This nifty technique is a must learn! So here is my list of 10+ ways to report variances so far. I would love to add more to it! But first let me know how do you like to report variances in your report in the comment section and if you have a technique with an x-factor then I would love to read about it! really impressive i was looking how to color different result different color .hanks or sharing . Tony (again), i bought the bundled file. It was a deal at 7 bucks and contains the tips that were mentioned as contained only in the downloadable files. Thank you once again. Great tips. I browsed your linked in site and it also contains some very helpful articles. Thank you for buying the bundle and leaving the comment or to be precise testimonial 🙂 I am really happy that you enjoyed the bundle and my linkedin feed. Keep excelling! That are some really neat tips! Thank you. Thanks Bruno for visiting the website and liking the effort!